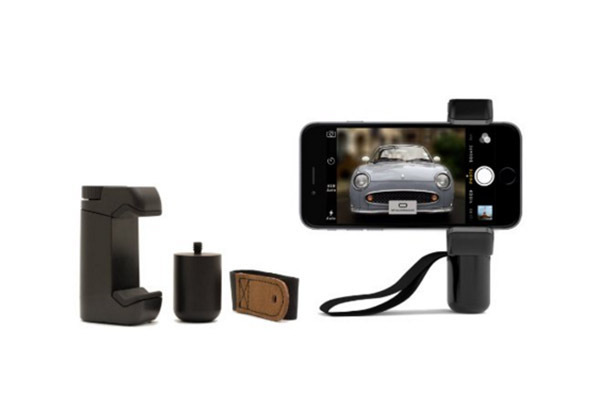 Price and Where to the BShoulderpod S1 Smartphone Grip: $35 on Amazon. Pros: This sturdy and durable three-in-one smartphone grip acts as a tripod mount, a hand grip, and a stand. As a tripod mount, it’s easy to use and extremely secure. As a hand grip (with a wrist strap), it allows you to do crazy stuff like shooting video while holding your smartphone out over the side of hot air balloon basket while minimizing the chances of dropping it hundreds of feet. Cons: Because it’s sturdy and well made, it’s slightly heavier than some other tripod mounts. But its adaptability and durability make the extra weight feel worthwhile. Usefulness: 10/10. The Shoulderpod allows you to easily up your mobile photography/moviemaking game by making it simple to attach a smartphone to a tripod. And since you can shoot video without having to hold the phone along its sides, you end up with steadier video. Value: 9/10. At $35, this is a competitive price for a multipurpose mount. Durability: 10/10. This grip is tough but handles phones gently. Final Verdict: I like it so much I’ve made the Shoulderpod S1 grip a standard part of the SmarterTravel mobile-movie-making gear kit.